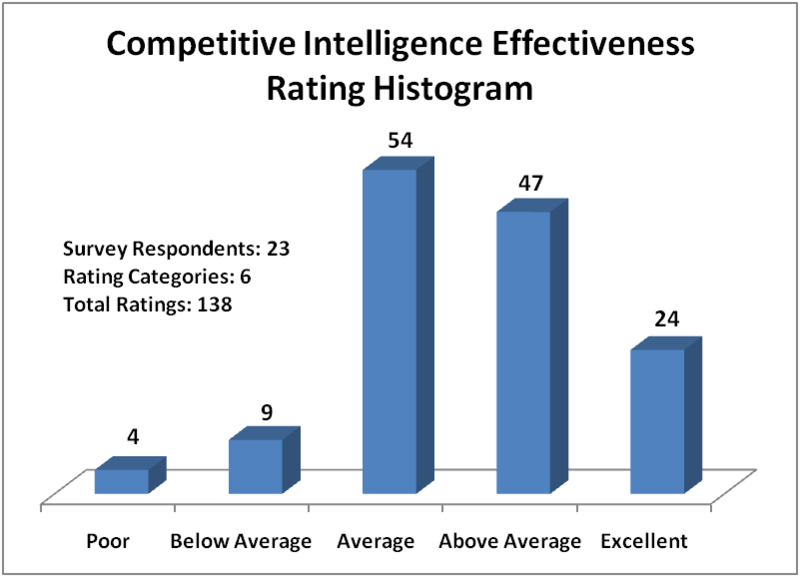 Strategically Thinking » Most Competitive Intelligence is Above Average? Most Competitive Intelligence is Above Average? I recently surveyed Competitive Intelligence professionals and received 23 responses. Admittedly, the survey is not scientific and the sample size is small. Furthermore, it was publicized in forums frequented by certain types of people. Namely, people that use social media such as LinkedIn (SCIP Group), CI NING and Twitter were targeted. My guess (and it is only a guess) is that these folks might be more active than the broad population of CI professionals in sharing and thinking about Competitive Intelligence. One other attribute of the survey is that it was intentionally short (only five questions). Hence, there is not much demographic or industry information included. 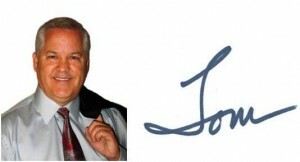 You can see all of the results on my website at http://www.jthawes.com/surveyci.html. Okay, caveats aside, the interesting result to me is that the self-rating (all companies combined) of CI effectiveness is above average in every category. The categories included the following. 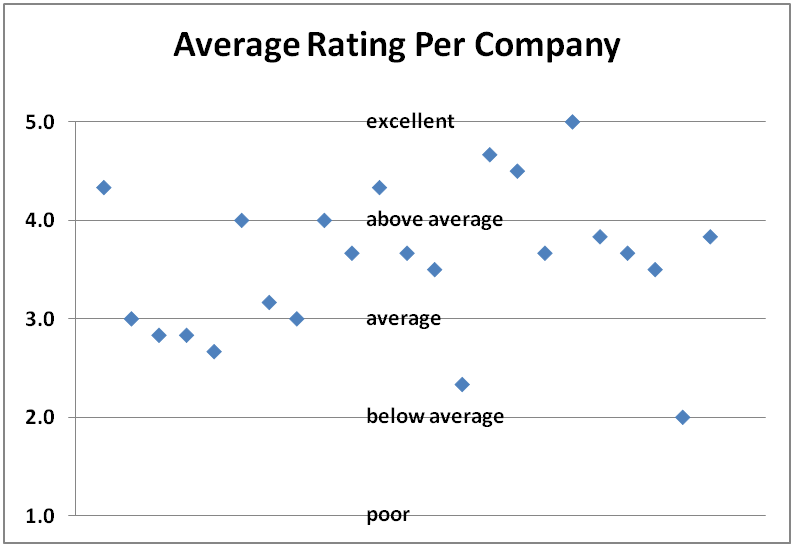 The distribution (based on averaging the ratings per company across the six categories) suggests that most of these companies are being well served by their competitive intelligence professionals. Of course, it would be better also to survey the CI customers to determine their perceptions. Indeed, I did some of this in my 2010 Strategy Survey last month. The results from fourteen organizations is described at http://www.jthawes.com/surveystrategy.html. In that survey, one measure of competitive intelligence (“Reacting to Competitors”) received the lowest rating from strategy leaders. Consider that for each of these six effectiveness areas, there were five possible responses (1=poor, 2=below average,3=average, 4=above average,5=excellent). Multiplying the six areas times the number of respondents means that there were 138 ratings. Observe that that the histogram shows a pronounced skew to the right (i.e., higher effectiveness). The survey results prompt more questions than they answer. For instance, how would most of our customers evaluate our competitive intelligence services? If collectively we are so effective, why are there (seemingly) widespread questions about the need for and delivery of competitive intelligence? How are in-house CI teams doing compared to CI consultants? What is the actual impact that CI professionals want to make in an organization? And, how do competitive intelligence professionals think about improving their skills? Maybe you would draw different conclusions than I did. What do you think that the survey results reflect? Very interesting Tom – thanks for sharing this – I just retweeted your link postulating an old cognitive bias – illusory superiority aka the “Late Wobegon Effect” – was involved. Thanks Tom for an insightful article.